Createspace Independent Publishing Platform, 9781478305705, 116pp. You, who have dug deep and sifted hard for a story to read have unearthed an ancient treasure: a mystery from the dusty ages, when a boy could be a hero and fight for the good of all . . .
12-year-old Zet and his sister Kat love running their family pottery stall. But it's a struggle to keep afloat, now that their father has gone north to fight the Hyksos invaders. When the siblings learn about a valuable scroll that's gone missing, Zet and Kat decide to join forces. If they can find it, they'll win a huge reward for their family. Their problems will be over Little do they know what troubles lie ahead. 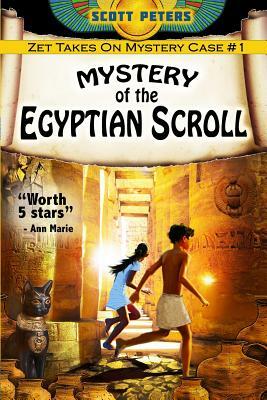 The chase leads Zet and Kat into the hotspots of ancient Egypt-from stunning temples to the Nile river, through a mysterious land of hieroglyphics, Egyptian gods and mythology, and majesty that the world has never forgotten.